Mr. Apichatpong Weerasethakul is a groundbreaking filmmaker, involved not only in producing and directing but also in script-writing and editing, who has been creating a sensation in the cinematographic world. His innovative method of ‘visual narration’ -- set in a dense forest, stories based on local folktales and legends are mixed with personal memories, episodes from previous lives, and also with comments on current issues -- has won international acclaim. Mr. Apichatpong Weerasethakul is a groundbreaking filmmaker who has been creating a sensation in the cinematographic world. He involves himself not only in producing and directing but also in script-writing and editing. His work has been highly praised for its innovative method of ‘visual narration’: his stories are set in a dense forest, and are based on local folktales and legends, but are mixed with personal memories and episodes from former lives, and also with comments on the current issues. He was born in Bangkok in 1970, and grew up in Khon Kaen in north-eastern Thailand. After studying Architecture at Khon Kaen University, he went to the USA to continue studying at the School of the Art Institute of Chicago (SAIC), and received a Master’s degree in Fine Arts (Filmmaking) in 1997. While still a student, he made and presented a series of experimental short films. When he returned to Thailand, he founded his own company, Kick the Machine, in 1999, to start his professional career as a filmmaker. His first feature film, Mysterious Object at Noon (2000) attracted much attention for his completely innovative technique which broke away from the usual concept of scripted and directed filmmaking: he filmed different people he met while travelling, and let them build up the story of the ‘mysterious object’ by each adding their own words to the narrative. His second work, Blissfully Yours (2002) which shows a young immigrant worker from Myanmar and a Thai girl meeting in a forest, won the Un Certain Regard Prize at the Cannes Film Festival. Moreover, Tropical Malady (2004) in which a young soldier encounters in the jungle a tiger that was a human in a former life, won the Jury Prize at Cannes. 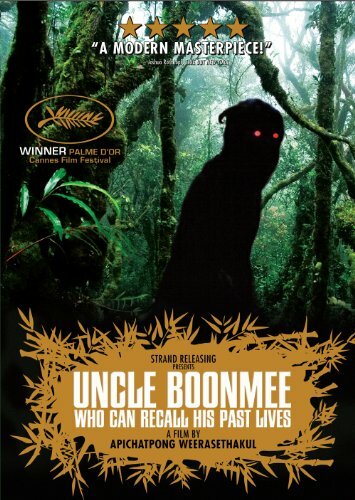 In 2010, for Uncle Boonmee Who Can Recall His Past Lives, he became the first Thai to be awarded the Palme d’Or Prize. The dying Boonmee, who lives deep in a forest, is visited by his dead wife and his son, who has transformed himself into a monkey. The film is filled with unique perspectives on life and death, and on humanity. Boonmee’s memories from his past, when he joined the oppressors of the democratization movement, were also inserted along with actual episodes of his former life. This has become one of his major works showing all the steps he has made in the decade since his debut. It was released in cinemas in Japan, too, and enjoyed considerable popularity. Since 1998, in parallel with filmmaking, Mr. Apichatpong has also been working energetically in the field of art, particularly on the visual installations. His recent work, Primitive Project, combines and connects different artistic media including a video installation, feature films and an illustrated book which presents a world view for the project. Uncle Boonmee Who Can Recall His Past Lives is included in this project. Mr. Apichatpong, as a standard-bearer for young artists with unconventional approaches to visual expressions, has been greatly inspirational to filmmaking circles across the world, and continues to be creative in diverse areas without getting trapped in conventional ideas of genre. For his great achievements, he truly deserves the Art and Culture Prize of the Fukuoka Prize.